The outdoor serving station at Guy’s Pig & Anchor Smokehouse/Brewhouse. 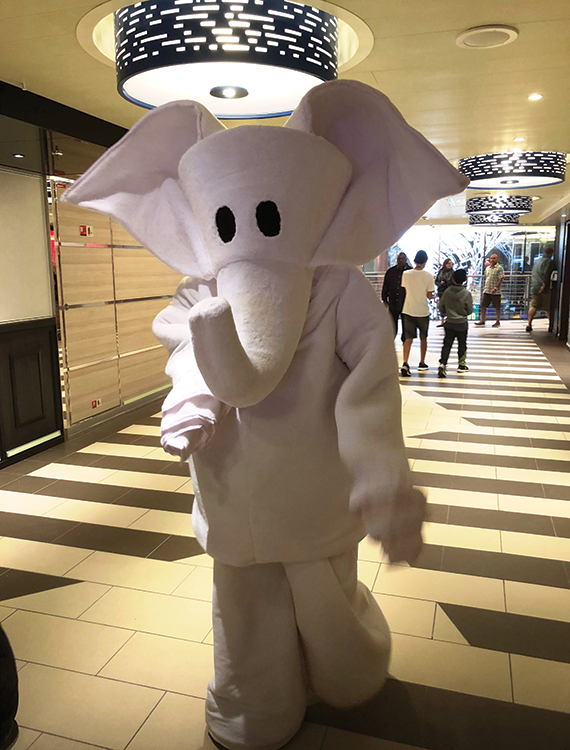 Photo Credit: Tom Stieghorst ONBOARD THE CARNIVAL HORIZON — Before this ship got its official name, Carnival Cruise Line president Christine Duffy liked to joke that it would be called the Vista Sista. The two ships are truly as similar as siblings, with just a few wrinkles separating the 2016-delivered Carnival Vista from 2018’s Horizon. One of the most noticeable differences can be discerned as soon as guests board the 133,500-gross-ton Horizon, however. The Horizon is the first Carnival ship to be equipped with “destination-based” elevators. The system, which was initially intended for the Vista, puts all the elevator floor commands on a touchscreen in the waiting area, rather than having them clustered on a panel inside the elevator itself. Passengers punch in their destination, and a software program assigns them the next elevator that is headed to their destination floor. The idea is to cut down on wait times. For anyone who hasn’t encountered the system on land previously, it takes a day or two to get comfortable with not having the traditional buttons to push inside the car. The walls next to the elevator doors look oddly empty, and one is left to trust that the system really will deliver you to the desired destination. Many of the features introduced on the Vista have been faithfully reproduced on the Horizon without any variation, including the Imax theatre, the Family Harbor Lounge and the amazing Dreamscape columns that anchor the main atrium and the casino bar. Up top, the nifty SkyRide recumbent bikes suspended from their dual tracks circle the funnel just like on the Vista. At first glance, the Havana Cabana section seems like another duplicate, but the warren of tropically themed suites has been enlarged, giving it 79 cabins, 18 more than on the Vista. On the top deck, the WaterWorks children’s water park has been festively rebranded with Dr. Seuss themes, with Seuss characters prowling the premises. 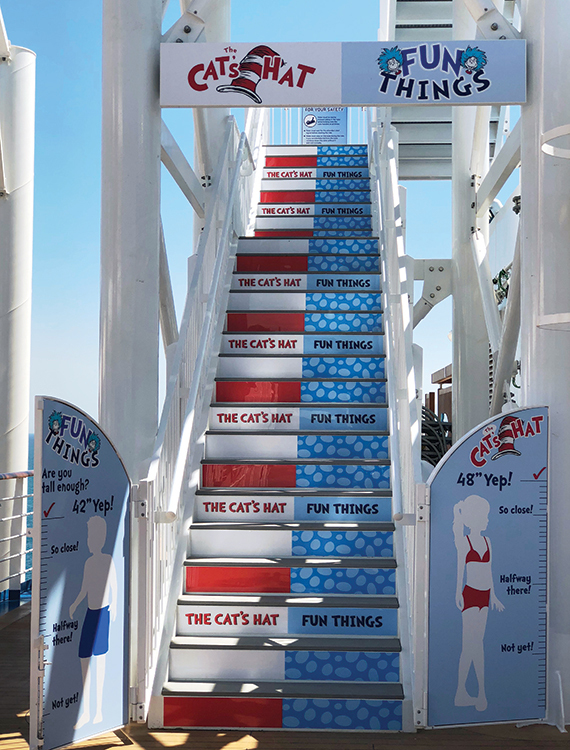 Kids can choose between the red-and-white Cat in the Hat slide or the blue Fun Things slide. There’s also a 300-gallon Cat in the Hat tipping bucket. In the atrium, Carnival has added new retail names such as Michael Kors, Hublot and Kate Spade. But the biggest addition for the Horizon is Victoria’s Secret store, the lingerie chain’s first full store at sea. Perhaps the greatest area of innovation on the Horizon has been in the food offerings, starting with Guy’s Pig & Anchor Smokehouse/Brewhouse, a name that requires some unpacking to understand. The Guy is Guy Fieri, the TV chef who has created a burger concept for Carnival and also some complimentary BBQ pit stops on a few Carnival vessels. 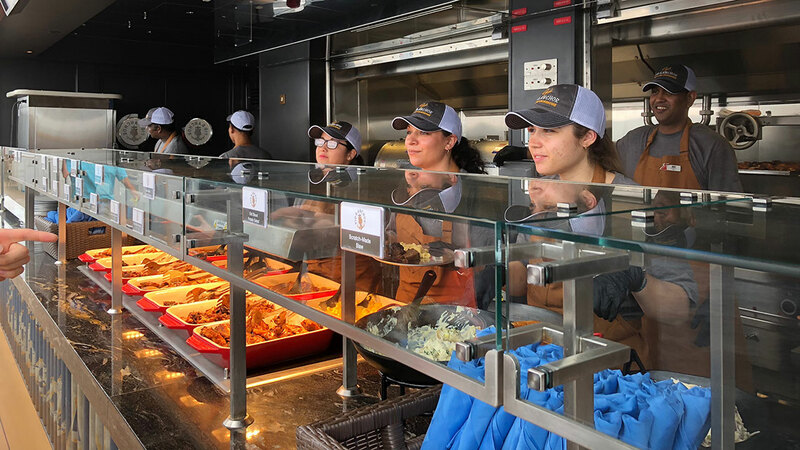 The Horizon is the first ship to have a proper barbecue restaurant, which accounts for the Smokehouse part of the name. It is open for free lunch on embarkation and sea days and at dinner with a la carte pricing each evening of the cruise. The Brewhouse is a relocation of the brewery on the Vista from the RedFrog Pub into the BBQ restaurant. Carnival’s brewmaster has created four craft beers intended to complement the smoky food. Another area where Carnival has combined venues is Fahrenheit 555, the steakhouse speciality restaurant that now has piano music at dinner. That was accomplished by relocating Piano Bar 88 from an area down the hall on the Vista to a space immediately adjacent to the steakhouse, where a private dining room sits on the Vista. A wall divider between the piano bar and the restaurant is opened during early evening when dinner begins. Another change in the steakhouse is dessert presentation, which is done with flair and brio at the table. 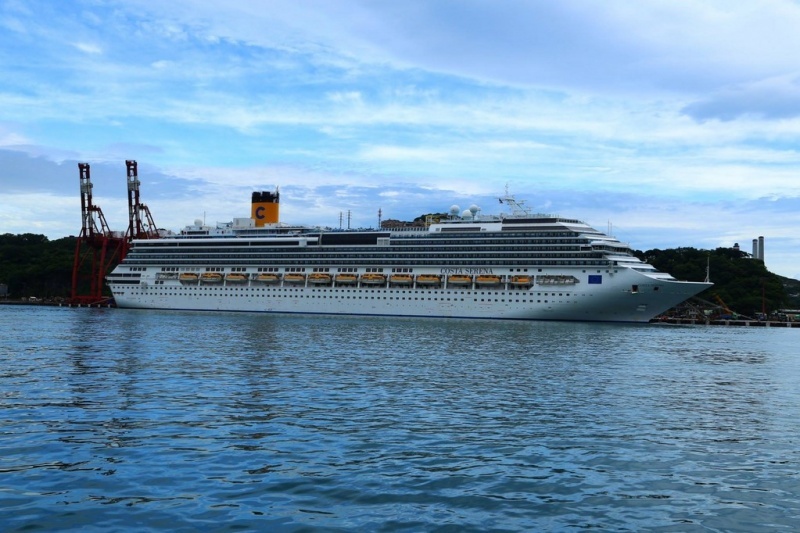 Carnival Cruise Line’s new flagship, Carnival Horizon, was presented today at the Fincantieri’s shipyard in Monfalcone, Italy. Carnival Corporation Chairman Micky Arison, as well as Carnival Cruise Line President Christine Duffy, attended the ceremony. 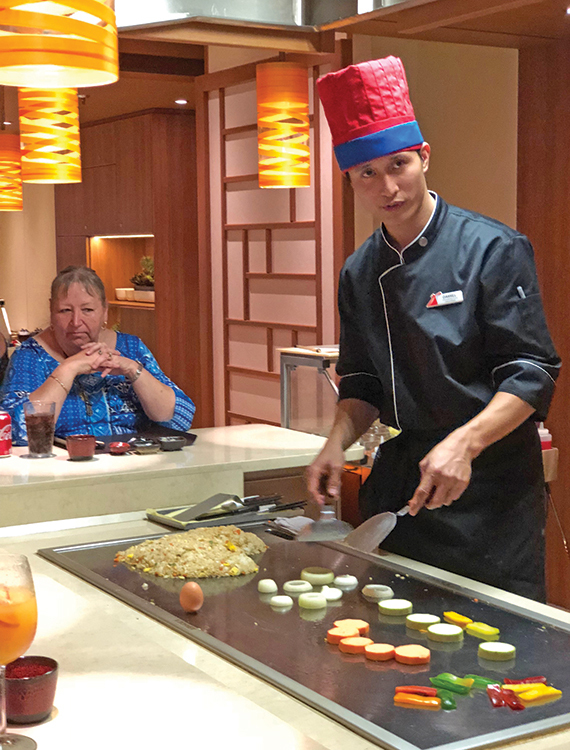 A sister ship to the Carnival Vista, the 3,954-passenger Carnival Horizon features an IMAX Theatre, craft brewery and smokehouse, teppanyaki restaurant, ropes course and Dr. Seuss-themed water park. And that’s not to mention the Havana staterooms and suites, which include exclusive daytime access to a Cuban-themed bar and pool. Grammy award-winner and actress Queen Latifah will christen the ship in New York City on May 23. Thereafter, Carnival Horizon will operate Mediterranean sailings out of Barcelona. She’ll move to New York for a series of Bermuda and Caribbean cruises before beginning six-night Caribbean sailings from Miami in the fall. 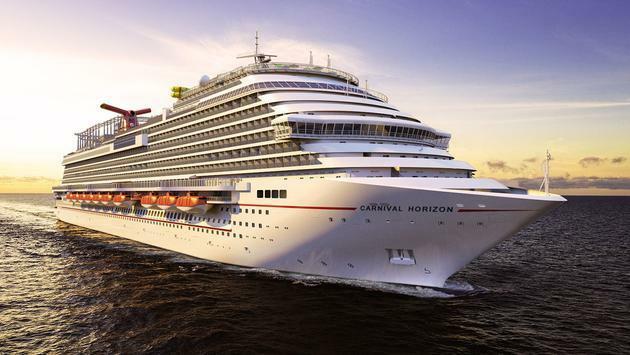 Another Vista-class vessel, Carnival Panorama, debuts in 2019. She’ll operate year-round from Southern California.